Successfully Added Portable Battery Charger (3400mAh) for iPad 2, iPhone 4, Electronics to your Shopping Cart. 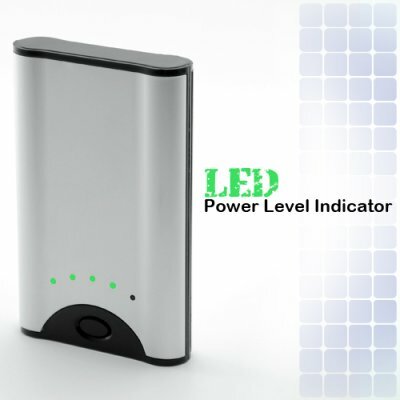 Portable Battery Charger with Power Level LED (3400mAh) - the most versatile solution for an emergency power source that works with most portable electronics especially iPhones , iPods and easily fits in your pocket. Take advantage of the Portable Battery Charger's 3400mAh rechargeable lithium ion battery to enjoy hours of extended play time on your small portable electronic products. The 7 adapter tips are compatible with most cell phones, smart phones, PDA, iPhone, Blackberry, iPod, MP3 players, Bluetooth headsets, and many other devices. The Portable Battery Charger is compact and portable and can be used at any time. Put one in your car and leave another at the office so you can recharge all of your electronic devices when you need it the most. Also included is a power test button and 5 LED indicators that will show you the amount of power left in the Portable Battery Charger. When it's low, all you have to do is connect the USB cable and charge it back to full again. With this one Portable Battery Charger, you get an unbeatable low-priced emergency power source for almost all of your portable electronics. Available in our warehouse now, order today and we'll express ship it out tomorrow. Brought to you by the leader in China Electronics - Chinavasion.